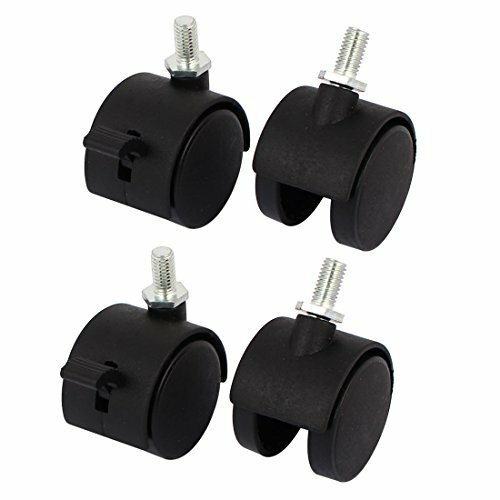 Features twin wheel design, Caster Wheel is perfect replacement for your broken one on your chair.Desinged with plastic double wheel, can protect your floor surface and reduce noise on the floor.The attached brake can stop wheel rotation with free or lock switch, easy operation.Ideal replacement for your broken caster wheel on your office chair, is easy to install with top plate. Thread Diameter: 8 x 18mm / 0.3' x 0.7'(D*L). Plastic wheels protect hardwood, laminate, tile, slate, and all other hard floor surfaces. Features standard 0.3 inch (0.8mm) Thread Diameter and easy-rolling 1.5' (40mm) twin caster wheels. Works Perfect On Carpets and any Hard Floors.